It’s less than a two-hour flight from Paris to Milan, but what a trip! 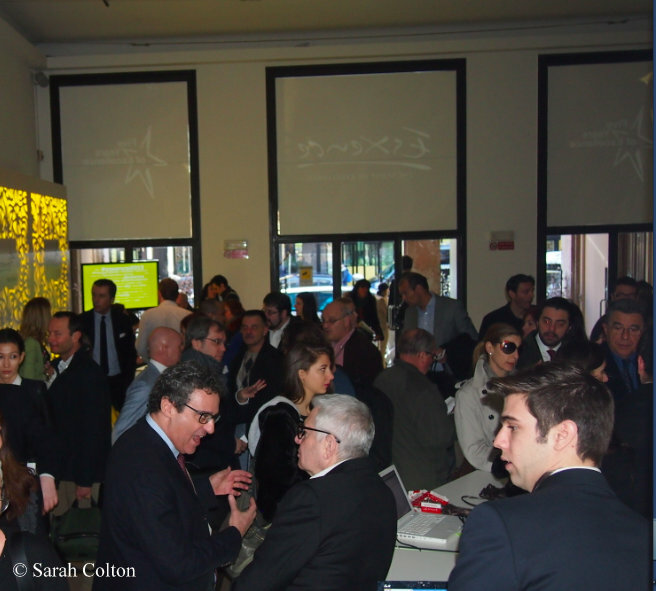 The 5th Edition of the Esxence salon started off with a bang – a ‘GOLD’ theme party to celebrate 5 years of success – and ended on a note of promise, with awards for excellence among young perfumers. In between, 4 intense days and nights of artistic niche perfumes, perfumers, programs, purveyors, the press, and more parties, all indispensible elements of Esxence, which promotes the values and energy of artistic niche fragrances, as well as the new and original business opportunities they represent. 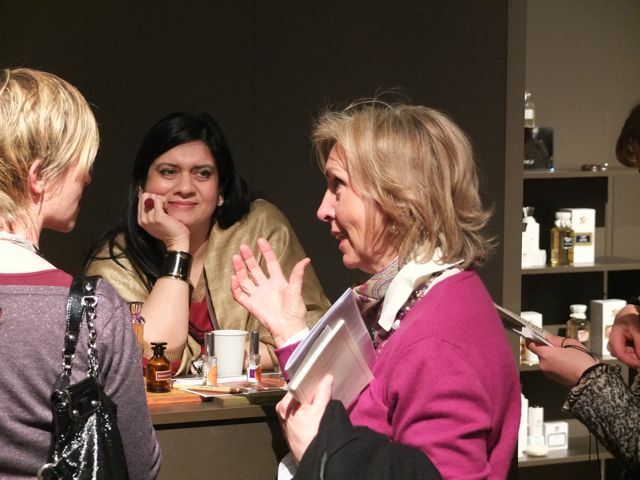 From the moment I arrived at the NH Touring hotel, around the corner from La Pemanente on Via Filippo Turatti where Esxence was to take place, I was immersed in the world of international niche perfumery. While standing at the check in desk, I recognized Roja Dove and his entourage at the next counter. A few minutes later Joe Garces walked into the lobby with his UK and French country teams, followed in short order by Michael Edwards. A texto from Raphaella Barkeley, Editor in Chief of ThePerfumeMagazine.com, informed me that she had just arrived from her million-hour flight from the west coast….When I arrived in my room I had a welcome email from Silvio Levi, and a note from Maurizio Cavezzali CEO of the Equipe International of ICE, the producers of Esxence. This Esxence connection and magic was to grow and live on, well past the moment the door of my Air France return flight to Paris slammed shut. A Perfume Competition, ‘The Scent of Esxence – 5 Years of Excellence’ was held during the event with contestants in 3 categories. Featured above is Cristiano Canali of ITALY, whose fragrance submission ‘Magnolia Esxentialis’ won the Jury of Critics award. The other winners were: Jury of Noses: ‘Stella’ by Sarah Grivot of FRANCE, and The Public Vote: ‘Etoilegance’ by Alexander Lee of the USA. Having just presided at the official ribbon cutting opening ceremony, Silvio Levi, co-founder of Esxence and Technical Committee President, was in his element greeting visitors, receiving and giving compliments, and loving every minute of this first day of Esxence, his brain-child, now in its 5th year. Seen here at the center of the photo and the crowd, Silvio is talking (with his hands) to Michael Edwards. Silvio Levi, and Maurizio Cavezzali cutting the Esxence 5th Anniversary cake at the ‘GOLD’ party held during the evening of the first day. Coquillete Paris creators, Rose Vaia and Elise Juarros at the “Gold” party. The next day, I discovered their collection of 4 fragrances inspired by soft breezes off The Amalfi coast and recalling the strength of the eternal feminine. 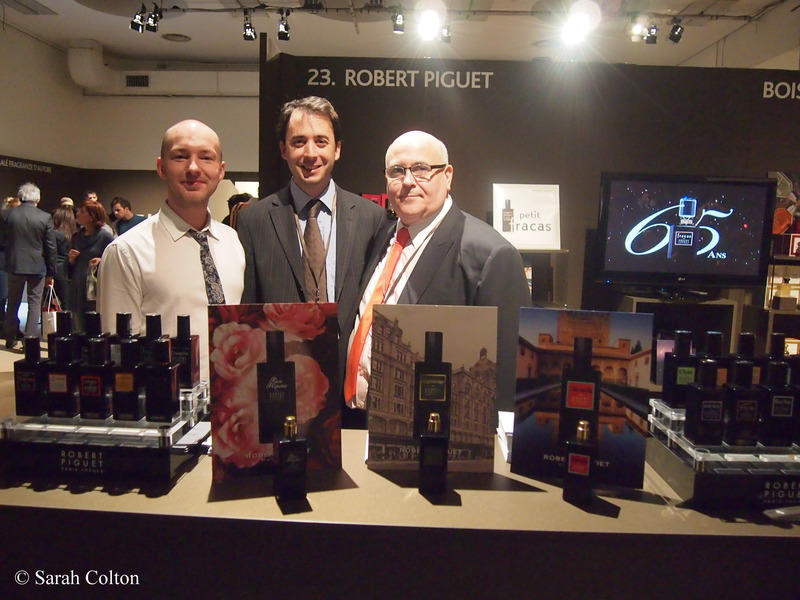 Simon Waddell, UK Brand Manager, Mathieu de Villelongue, Brand Manager France, and Joe Garces, CEO at the Robert Piguet stand. ‘Knightsbridge’ the newest Piguet fragrance is available exclusively in Harrod’s, London, and was voted ‘Fragrance of the show’ at Esxence by Mark Behnke, Managing Editor of the perfume blog, Cafleurbon.com. Neela’s perfumes, inspired by the history, culture, nature and modern life of India. The Vedic tradition suggests that wisdom is eternal, and Neela displays all sides of wisdom as visitors explore the fragrances at her stand, all created for her by perfumer Bertrand Duchaufour, and presented in exquisite multi-facted bottles designed by Pierre Dinand: Trayee, represents the boundless spiritual landscape of the great Vedic period; Mohur, the most powerful empress of the Moghul Dynasty; while Bombay Bling, joyfully proclaims the colorful and eclectic side of modern India. Panel Discussion on “New Retail Proposals in International Niche Fragrance Distribution. 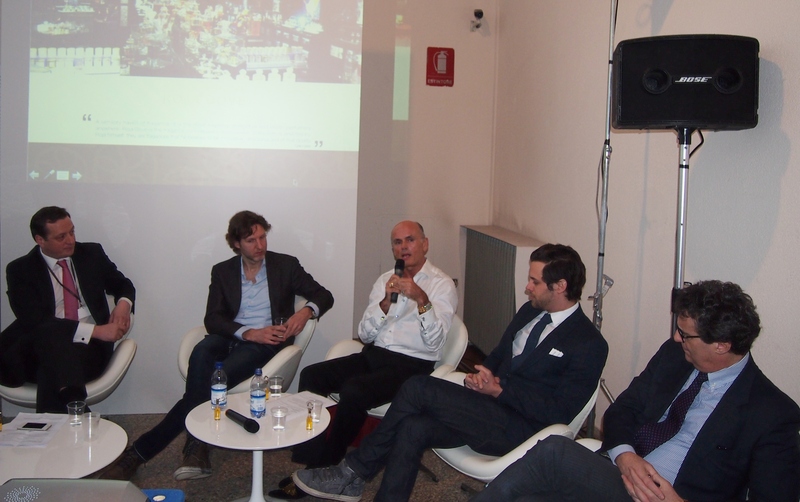 Among the activities offered at Esxence, a number of panel discussions and lectures were held each day. Lectures of note were “Guy Robert and Josephine Catapano” by Michael Edwards, author of the perfume bible, Fragrances of the World; and Perfume Bottles Design, by Pierre Dinand, renowned bottle designer. I had the honor of moderating one of the panel discussions “New Retail Proposals in International Niche Fragrance Distribution”. Panel members included from left to right: François Hénin, owner and founder of JOVOY, in Paris, Philip Hillige, owner of retail and distribution brand, SKINS COSMETICS, which includes 8 and soon 10 boutiques in The Netherlands, Roja Dove, owner of “The Roja Dove Haute Parfumerie” in The Urban Retreat at Harrods, London, Nicolas Cloutier, CEO and co-founder of NOSE, in Paris, and Silvio Levi, owner of CALE’ Fragranze d’Autore, in Milan. 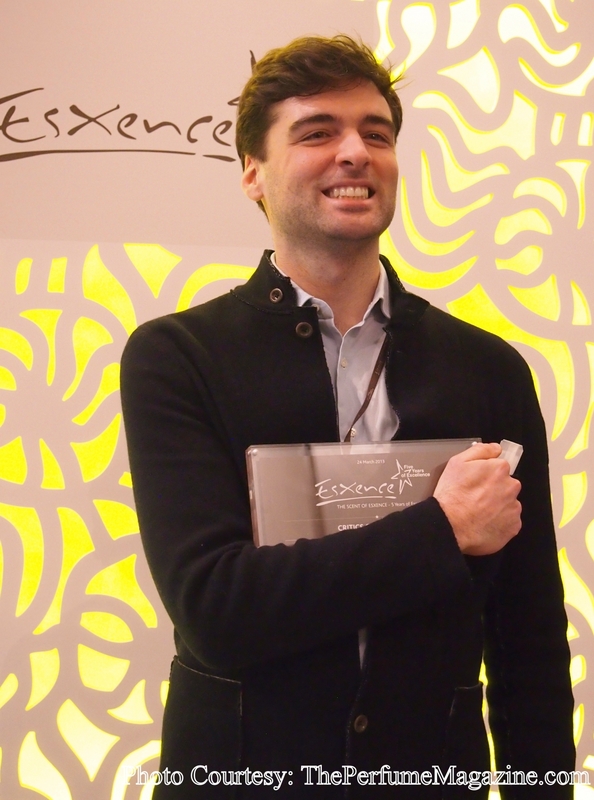 It was a pleasure to work with you and your whole team at Esxence, Silvio. Thanks for making the entire event enjoyable and beneficial for us all. Looking forward to next year.